Onions are a very easy crop and one of the most useful vegetables to grow. Onions store well, make great use of space, and are used in most dishes in the kitchen. Let’s see how to grow onions for salads and cooking. Do you use onions a lot? Our family uses LOTS of onions! I wish we could grow enough for all our needs, but we’d need a lot more garden space. So we only grow green onions and use them in salads and as garnish to soups. So how many onions should you plat? If you eat a lot of sauce based dishes such as pasta dishes, stews and curries, you’d probably get through 2 or 3 onions per week, so plant about 150 onions. But if you are using up lots of them in chutney, relish, soups and ketchup you’ll need a lot more. For a good number to use in your kitchen, grow 200 overwintering (storage) onions, 300 white onions and 200 red onions. Preparing the soil for onions is quite straight forward. Onions are really easy to grow and don’t require much. Make sure the soil has good drainage and the onions spot is in full sun. Incorporate some garden compost, and a week or so before planting, dress the soil with a dusting of Fish, Blood and Bone fertilizer. You can grow onions from seed or from sets (immature bulbs). Each method has its different advantages. Onion seeds offer a wider selection of varieties, are cheaper, and possibly store better. Onion sets are much easier to grow, offer more resistance to diseases and have a better success rate. 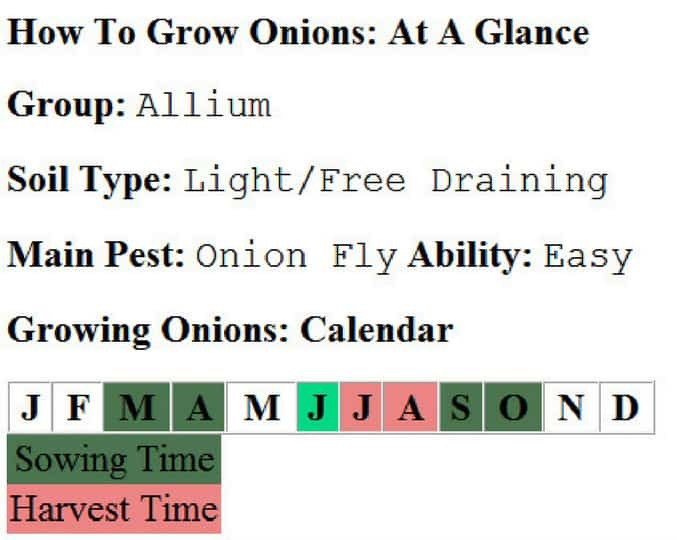 If you are new to growing onions you may choose to sow by sets, but if you would like to give onions seeds a go here is a quick guideline. 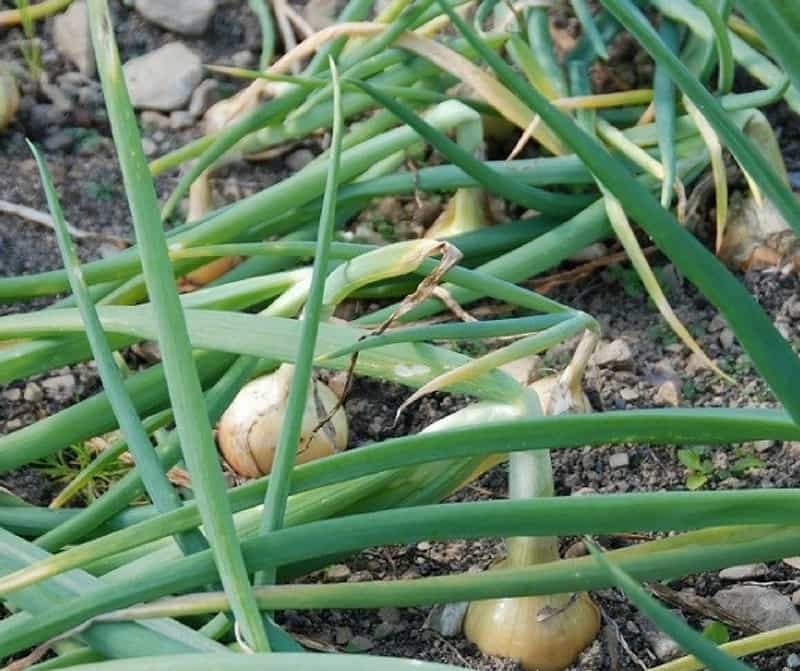 To grow onions from seed, start around 2 months before the last frost, usually in March. Sow onion seeds in small pots or trays: scatter seeds thinly and cover lightly with a general purpose compost. Keep indoors until the seeds have germinated. Move them to a cool greenhouse or cold frame before hardening them off. Plant outside when they are pencil size in mid May. Try to keep the young seedlings under 15 degrees before they move outside, and space out in the same way as onion sets (see below). Growing onions from sets is much easier, although buying the onion sets can be a lot more expensive. 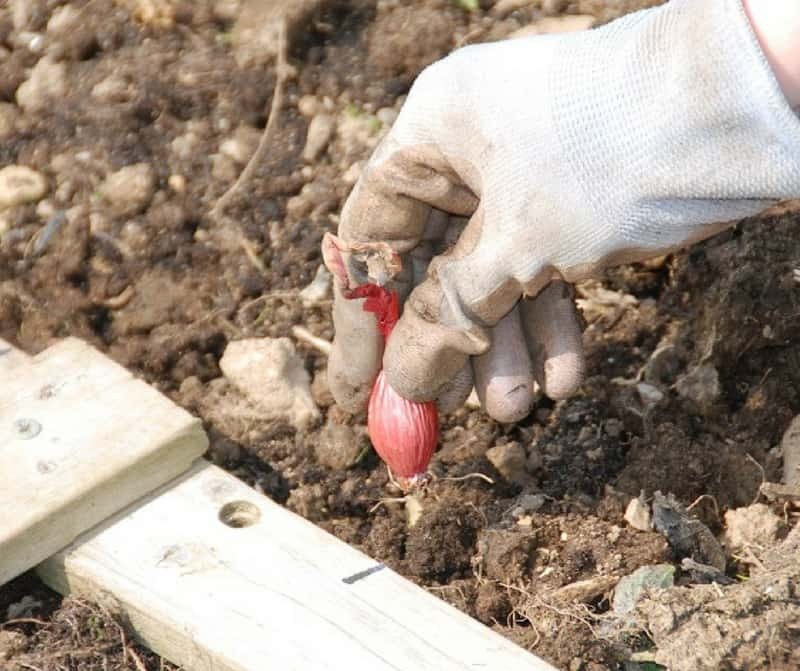 Plant sets either in March or April: poke a small hole for the onion bulb to sit in (my husband uses his finger to make the hole), place the bulb fat end down and cover lightly with soil. Space the bulbs 4 to 6 inches from each other in rows with spaces 8-12 inches apart. Bear in mind that the smaller the gap between rows, the smaller the onion will be. We like to plant several sets at a week interval, so we can have green onions for our salads. We plant the onion sets around the edge of our raised beds in our veggie garden. Do keep an eye on newly planted sets, as birds do find pulling out the bulbs great entertainment, and a bored bird could turn out the whole bed. If you have any cheeky birds, it may be worth netting them until they have rooted in. 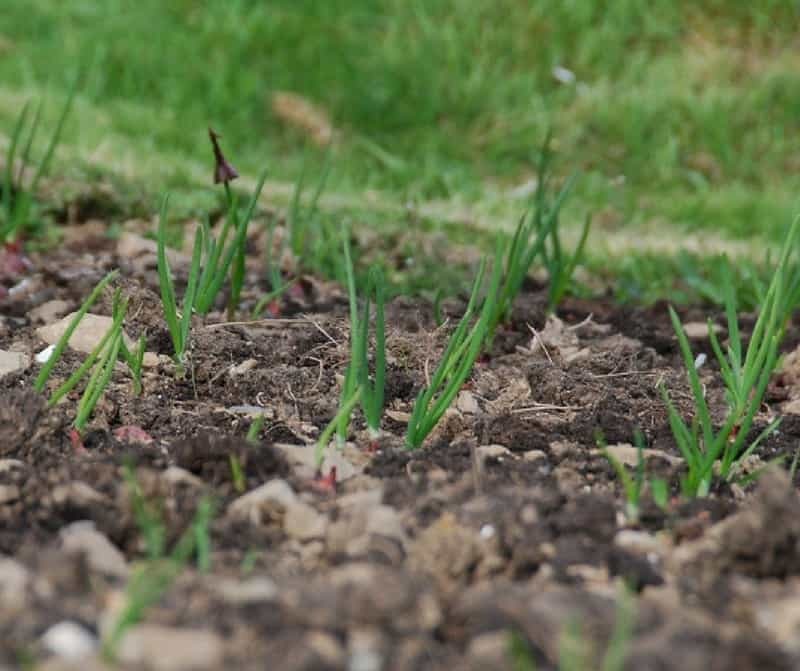 Bolting onions can be a problem, particularly if they are planted too close together, or even if the weather warms up quickly. The solution is quick and easy: simply cut off the flowers before they form. Throughout the growing season, simply keep weed free and water in dry spells. To extend the onion season you can also plant overwintering onions, also known as Japanese onions. We LOVE doing this: it gives us a nice fresh crop of onions very early in the spring. 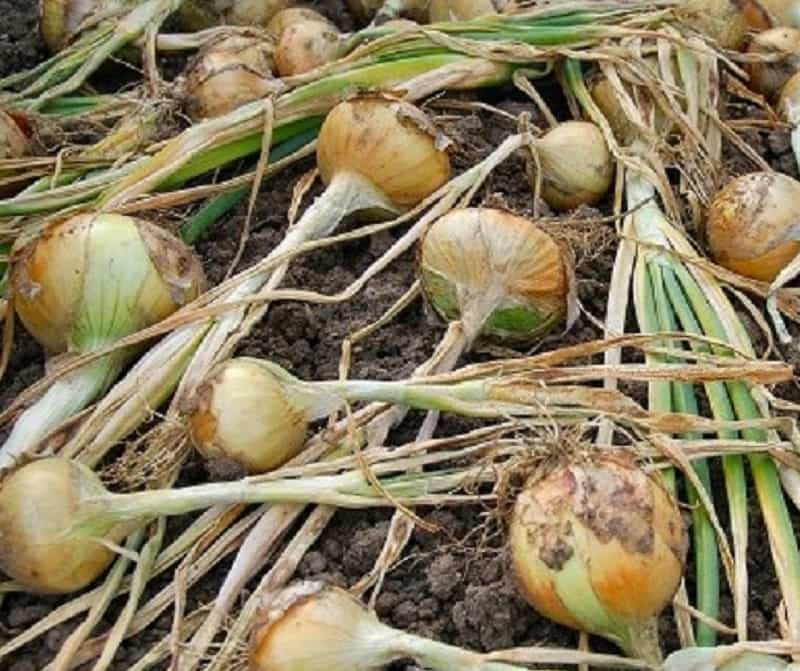 Overwintering onions will need to be planted in September or October and will be ready a month or two before the true summer crop. Onion fly is probably the most troublesome problem, but if you grow from sets, you should avoid these grubs. If you do get any problems, you could cover the bulbs until they develop a little more, and by hoeing regularly you’ll expose the grubs for the birds to snack on. The following problems are more rare, but you could experience them. Onion eelworm can distort the developing bulb, but a good crop rotation should control this. If the problem is bad grow brassicas or lettuce on the bed for a number of years. White rot is evident by a moldy growth near the neck of stored onions, it turns them soft and eventually rotten. 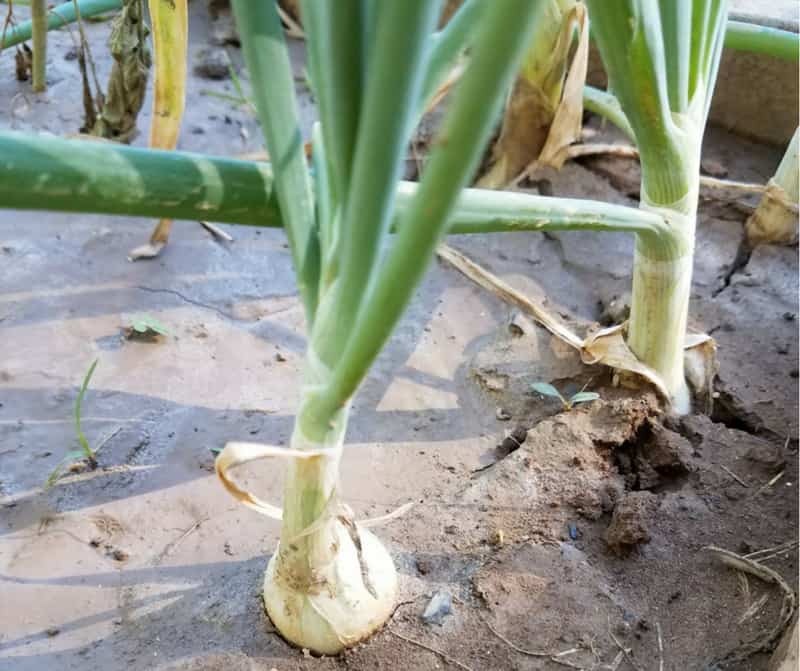 Often this rotting can be caused by forcing onions leaves over in an attempt to induce maturing, so avoid doing this and let the leaves bend over naturally before harvest. There are other bacterial and fungal diseases that can attack stored onions, simply discard rotten onions to protect other bulbs. Neck rot is a disease that kills the plant in the ground. When affected, the onion will turn yellow before dying. 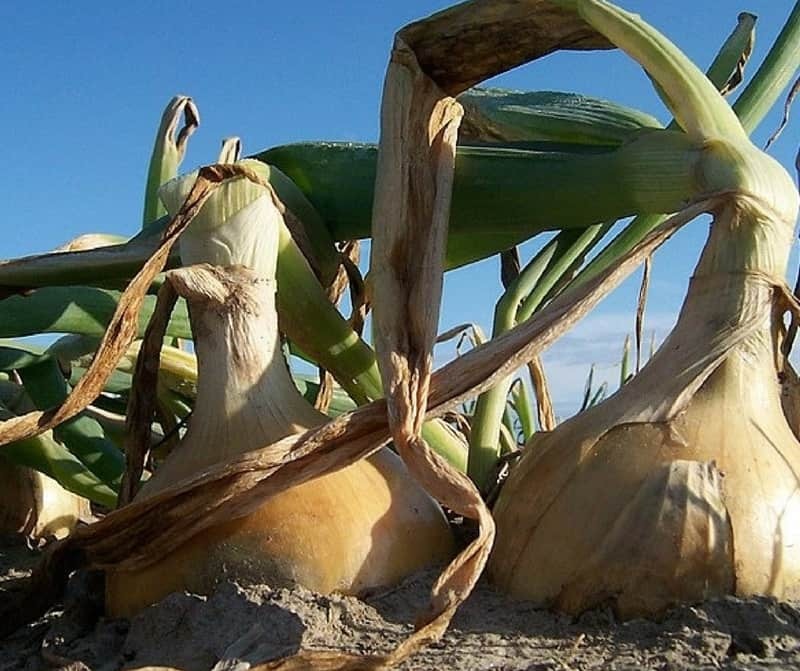 There is not a lot you can do about this: just remove the affected plants and keep to a good crop rotation plan. Do not allow any allium group plant on the same part of the garden for at least two years. Harvesting onions can be done just weeks after planting, if you want to use the fresh, green onions (also known as scallions) in your salads. 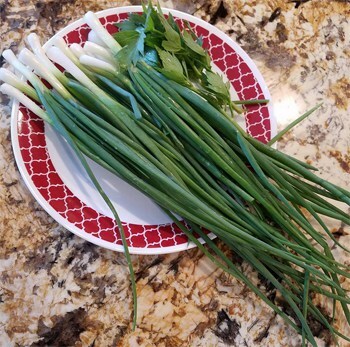 If you intend to harvest green onions, plant the bulbs closer (2 to 4 inches as opposed to 4 to 6 inches) and harvest every other onion to use in spring salads, and leave the rest. If you want to harvest full grown onions, do it in mid to late summer. You’ll know it’s time when the leaves will start to turn brown and bend over. Harvesting onions is really easy. Simply lift the onions from the ground, shake the dirt off, and leave them outside on a drying rack or even on the ground. If it rains then cover the onions as it is the air that you need to dry them out effectively. You can then either remove the leaves and store in a net bag or leave the leaves on to braid and hang. Some gardeners will tell you to bend the leaves over to help them to mature, but this can cause damage to the neck. And don’t be tempted to dry your onions in the greenhouse, if it is warm the onions will start to cook and they will not store. Onions are one of the staples in our home. They give great taste to many dishes, so we use them a lot! Soups and chutneys will use up a lot of onions along with another crop like tomatoes, but if you have more onions compared to other crops to use up there are a few dishes that are purely onion based. The classic French onion soup comes to mind right away, as does a great onion and thyme tart. Generally, onions don’t freeze well raw. Cook them first to the transparent stage, then freeze them in small amounts in Ziploc bags. They’re the ultimate convenience food. Onions are a great vegetable to grow, both because they are healthy but because they give so much flavor to almost every savory dish. Thanks for these gardening guides! I can never get my onins to grow into a large bulb. They mainly grow as bunching onions. What am I doing wrong? Anita, are you planting the onion sets? If so, they might be too close. Or do you grow them from seeds? If so, plant them at bigger intervals. You can also thin them out, and use them in salads. The remaining ones will grow into bulbs if they have enough room.